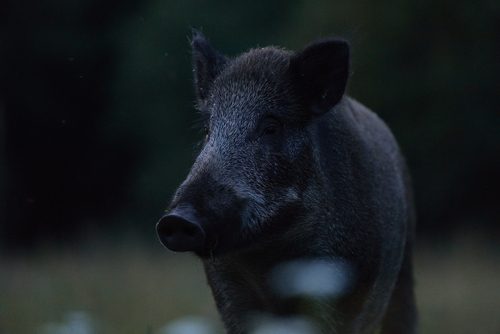 Searching for feral pigs in the dead of night isn’t an image that usually comes to mind when you think of “north Texas hunting.” Although many hunts take place during daylight hours, many of the creatures we hunt here at Nine Bar Ranch can be nocturnal. The old world species that belong to the family Suidae are better known as wild hogs. Specifically in Texas, a wide range of European wild hogs, feral pigs, and European-feral crossbreeds can be spotted rambling across the sandy terrain of the Lone Star state. As more generations are born, these beasts lose more of their domesticity and gain the skills that are crucial for surviving in Texas. Because of their ability to adapt for survival, the optimal time to track down these big-bodied beasts is at night. With the growing feral hog population and increased hunting, the animals have developed a lifestyle of nocturnal living. Of course, that’s their feeding time as well, so it’s an ideal time to hunt them. The exceedingly warm days further encourage our prey to take to the night, and it makes life easier for us, the hunters. At Nine Bar, you have the opportunity to hunt down these creatures on foot and from vehicles while using specially designed gear such as thermal scopes, night vision goggles (NVG), and infrared laser beams. Even better, all you have to do is schedule a time to hunt, and we will provide all of the necessary gear (and tips). Hogs have an outstanding, sharp sense of smell, which means that they can easily smell you as you track them. Because this is one of their strongest senses, they rely on it to seek out and track down food. Believe it or not, they can smell odors between 5 and 7 miles away. Our tip: Set out feeders with some of their favorite, natural foods. Acorns, fruits/nuts, corn, and oak mast are great fillers for your feeders and will provide optimal attraction for your prey. Your goal is to create a natural attraction to your feeder, and once the hogs associate your feeder with tasty food, they’ll be running back for more repeatedly. Though the moon will provide a minimal amount of light, you’ll want to utilize some additional form of light to ensure that you will make the kill. Naturally, you don’t want to alert the hogs to your presence, so the paramount form of light will be discreet and dim. Since feral hogs are naturally aggressive animals, an overly bright or white light may scare them away or cause them to be more hostile. Our tip: Attach a low red light to the underside of the feeder to ever so slightly brighten up the area which will ensure that you’ll get your kill on the first shot. Feral hogs are non-native to the United States and are normally exceedingly destructive, so typically, state-to-state regulations vary. If you’re going on a trip in your state or another state, be sure that you know the regulations before you set out. There are several southern states that permit use of artificial lights during nighttime hog hunting. When you hunt with us at Nine Bar Ranch in Texas, we will educate you on all of the state and local regulations in our area. We take out small groups on each hunt, knowing that the hogs can easily sense changes and new noises/smells in their surroundings. Be prepared to have a once-in-a-lifetime experience that is incomparable to any other hunting trip. Rest assured that you’ll be returning home with a trophy. Be sure to contact us if you have any questions, concerns, or want to set up a trip with us.